This statement pillow was a painful inspiration during an early morning power outage and I blame it all on Bob! 5 am is normally when I wake up and unless I can quietly amuse myself (with a book or magazine) I get up and slip out so I don’t disturb my Dear Husband. My normal routine is to turn the heat up, open my laptop and while it is powering up, I put the coffee on. This morning however, I got caught up in checking my emails, which of course led me to clicking on the silly foolishness regularly found in @bobborson ‘s blog. Bob is a highly accomplished architect who hits funny bones with stories like how to shoot a rubber band. This morning’s post, Architects Bingo Card was deliciously funny for at least 5 minutes until I realized the coffee maker wasn’t on yet. 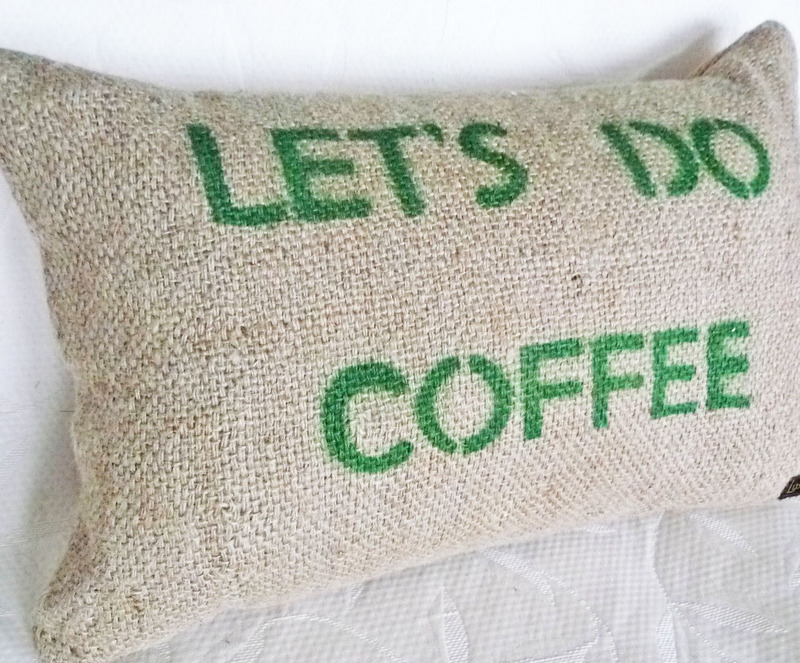 I ground the coffee, selected strong, pressed ON, then …flick. It was terrifying to think about spending the next two hours in the dark, with no coffee and no internet. Plan A. While I prefer Starbucks, I decided Tim Hortons would be better because they have a drive-thru and wouldn’t mind my jammies. Zoom zoom! I was out the door, into the garage and with my truck in gear I pressed the launch button….nothing happened. It never occurred to me that the garage door wouldn’t open. I know, I know, I could have pulled some string-or-thing to manually open the door… if only I’d have paid more attention to dear husband. Plan B. Under the front seat of my truck I keep a transformer thing which I plug my laptop into for recharging. The water in the coffee maker splashed out a bit as I bounced down the stairs with it in my arms. With it parked on my lovely leather seats I plugged it in to the transformer and then plugged the transformer into the cigarette lighter. Brilliant! When I started the ignition there was a brief flicker of light on the coffee console and then nothing. I tried lifting the coffee maker up high enough so I could read its wattage… more water splashed out. I wasn’t sure if I could get electrocuted but I knew for certain I would gas myself if I didn’t turn the truck off. Plan C. Surely with two gas fireplaces in the house, one of them could heat the campfire peculator … except that I had never noticed both operate on electric ignitions. Figuring out how to light them manually wouldn’t be hard… I would just Google it. My Blackberry internet connection at home is poor but reception can be boosted if I stand on top of the motorhome. … except that it is in storage. Thank goodness we kept its 50 foot extension cord in the garage! With one end plugged into the truck transformer I threaded the 50′ of cord up the stairs and into my office. Yay!!!! the modem powered up! It seemed like forever for the power to come and when it did I trampled Dear Husband to get to the coffee maker. 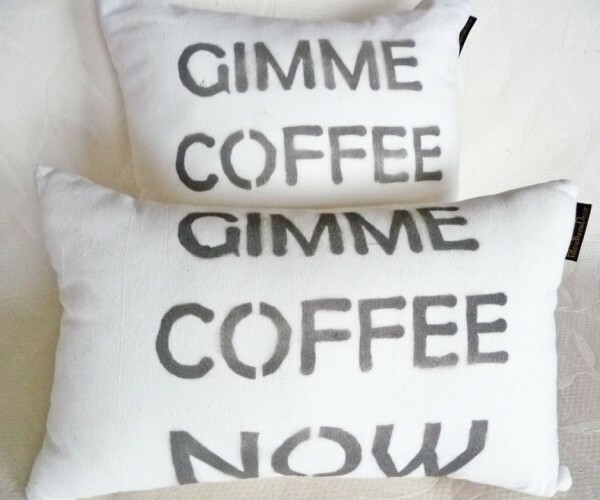 Gimme Coffee NOW was all I could think of all day. OMG, your story is hilarious! 🙂 I remember during the ice storm in 1998, tensions were mega-high in the morning with no power and no coffee! Not being a coffee drinker myself, I didn’t understand the big deal – so what if there’s no coffee. But when my mom said “GO TO MCDONALDS AND GET US COFFEE NOW!”, I was out the door! LOL… your mom and I probably have a lot in common 🙂 Gimme chocolate NOW is a very good idea! Hmmm… I think I’ll work on that! Too funny. Being a somewhat serious coffee drinker, I so understand the NOW part. 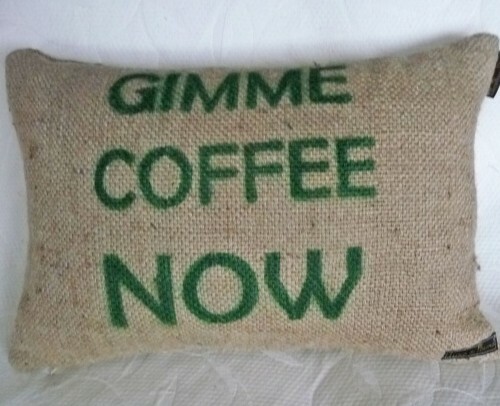 I am proud to announce my coffee pillows are being sold in a retail boutique in Gastown in Vancouver Canada. Woo Hoo… Martha Move Over!